AT91Bootstrap is the 2nd level bootloader for Atmel AT91 SoC providing a set of algorithms to manage the hardware initialization such as clock speed configuration, PIO settings, DRAM initialization, to download your main application from specified boot media (NAND FLASH, serial FLASH (both AT25-compatible of DataFlash), serial EEPROM, SD Card, etc.) to main memory and to start it. AT91 chips embed a boot ROM code. It is enabled depending on BMS (Boot Mode Select) pin state on reset. The ROM code scans the contents of different media like serial FLASH, NAND FLASH, SD/MMC Card and serial EEPROM. 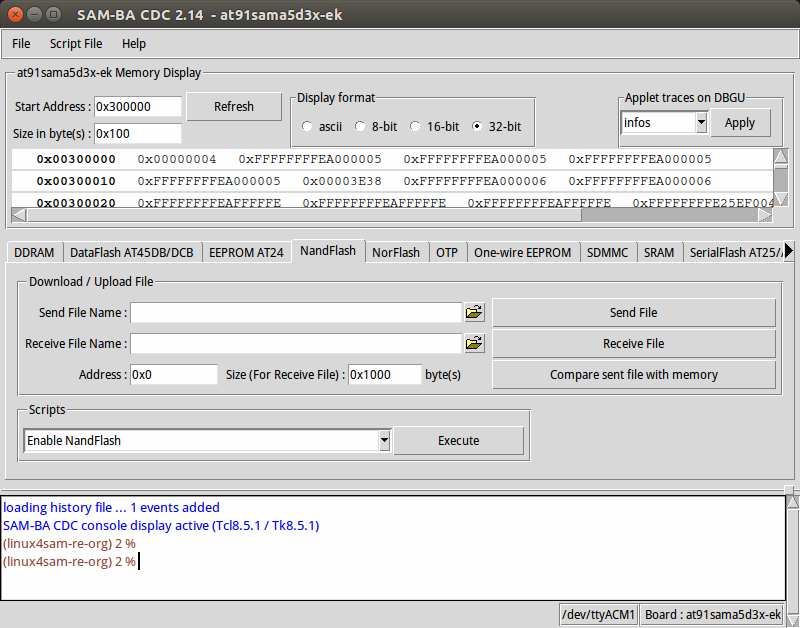 If a valid application is available then it downloads this application into the chip internal SRAM and runs it. To determine if a valid application is present the ROM code checks the eight ARM exception vectors. If no valid application is available then SAM-BA Monitor is executed. It waits for transactions either on the USB device, or on the DBGU serial port, then the SAM-BA tool can be used to program FLASH or EEPROM present on your board. For more information on this topic, please check the corresponding SAM product datasheet section Boot Strategies. By programming BSC_CR register, we can bypass some steps in above sequence. Note need a reset to make BSC_CR effective. And BSC_CR will be restored to factory value if power is removed. If using an old toolchain, there have been reported issues. Please see the document KNOWN ISSUES for your release which is inside the source code. We always recommend using up-to-date toolchains. This section describes how to get source code from the git repository, how to configure with the default configuration, how to customize AT91Bootstrap based on the default configuration and finally to build AT91Bootstrap to produce the binary. take the default configuration to download U-Boot from NandFlash for example. You can easily download AT91Bootstrap source code on the at91bootstrap git repository. Receiving objects: 100% (10880/10880), 4.03 MiB | 395.00 KiB/s, done. Resolving deltas: 100% (8300/8300), done. Tips: nf means to read nandflash, df means to read serial flash, sd means to read mmc card. Tips: linux means to load linux kernel to RAM, android means to load android kernel to RAM, uboot means to load u-boot to RAM, dt means to load dtb to RAM. If the configuring process is successful, the .config file can be found at AT91Bootstrap root directory. Now, in the menuconfig dialog, you can easily add or remove some features to/from AT91Bootstrap as the same way as kernel configuration. Move to <Exit> with arrows and press this button hitting the Enter key to exit from this screen. If the building process is successful, the final .bin image is binaries/at91bootstrap.bin. 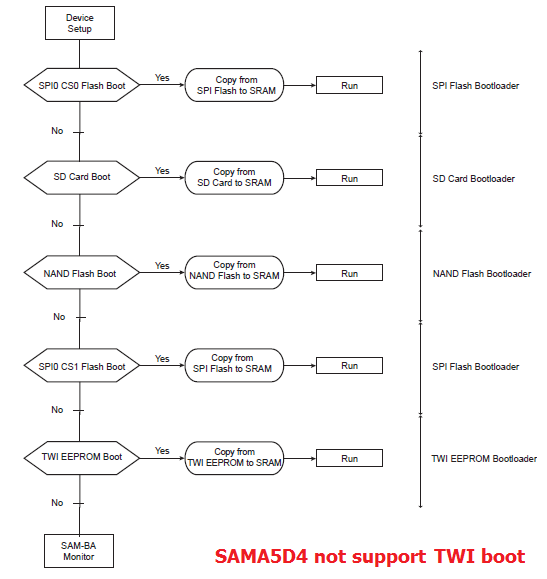 According to this section (take sama5d3xek as example) make sure that the chip can execute the SAM-BA Monitor. Select the board: "at91sama5d3x-ek" in the drop-down menu and choose the USB connection. When ROM code load AT91Bootstrap in nandflash, at first ROM code will check the header to know what kind of ecc that binary is stored in nand. setenv erase_bootstrap 'nand erase 0 10000'          # erase first 64k nand. Create a new directory to hold your board specific code under contrib/board/ directory. Add any files you need. In your board directory, you will need at least the "board.mk", a ".c", ".h", "Config.in.board", and "Config.in.boardname". Create the necessary default configuration files such as "df_uboot_defconfig" in your new board directory. Add(source) your board's "Config.in.board" in "contrib/board/Config.in.board" file. Add(source) your board's "Config.in.boardname" in the "contrib/board/Config.in.boardname" file. Add your board's ".h" in the "contrib/include/contrib_board.h" file. Run "make df_uboot_defconfig" with your new name. Type "make", and you should get the final .bin image can be found under the binaries/ directory. To contribute to AT91Bootstrap you should submit the patches for review to the github pull-request facility directly. About the latest version, some issues are found not fixed, please see the document KNOWN ISSUES with the project.